Layered Fragment by Habitat Workshop by Interior Design professor Jieun Yang has been named a 2018 NYCxDESIGN Award Honoree in the Architectural Installation / Pop-Up category. The program celebrates outstanding talent across major areas of design such as architecture, interiors, furnishing, lighting, and technology, and unifies more than 500 events taking place during NYCxDESIGN, New York City’s showcase of global design. 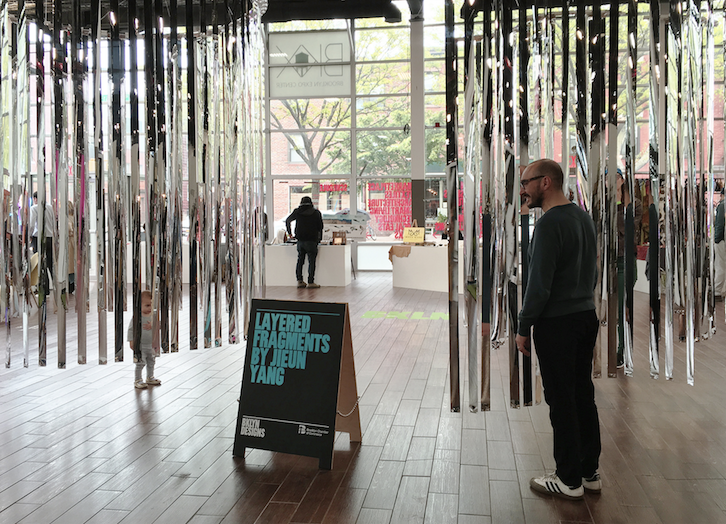 Layered Fragments is an interactive transient experience between the two 10’x10’ interior sites, designed specifically for BKLYN DESIGNS 2017. The project challenges the notion of fragments as separation by highlighting moments of visual and tactile connections resulting in weaving of diverse individual experiences. Hung from the ceiling structure, visual gaps between reflective mylar strips draping from polypropylene tubes curate the experience of the installation “inhabitant” to engage with “outside” surroundings while drawing in “outside” visitors. By pairing a perfect circle (Part A) and layers of fragmented arcs (Part B) in dialogue, the spatial experience of approaching, inhabiting, and exiting negotiates through varying thickness of layering and distortion leading to a kaleidoscopic collage that celebrates connections made through diverse experience and talent represented at BKLYN Designs.